This example tests a binomial proportion by using a four-stage group sequential design. Suppose a supermarket is developing a new store-brand coffee. From past studies, the positive response for the current store-brand coffee from customers is around 60%. The store is interested in whether the new brand has a better positive response than the current brand. The NULLPROP= option in the SAMPLESIZE statement specifies for the sample size computation. When BOUNDARYSCALE=MLE in the PROC SEQTEST statement, the procedure displays the output boundaries in terms of the maximum likelihood estimates. When CEILADJDESIGN=INCLUDE in the SAMPLESIZE statement, the table also displays the ceiling-adjusted design information. When you specify ADJUSTEDBOUNDARY=BND_PROP in the ODS OUTPUT statement, PROC SEQTEST creates an output data set named BND_PROP, which contains the resulting ceiling-adjusted design boundary information for the subsequent sequential tests. The "Design Information" table in Output 90.4.1 displays design specifications and derived statistics. With the specified alternative reference , the maximum information 670.38 is also derived. The "Boundary Information" table in Output 90.4.2 displays the information level, alternative reference, and boundary values at each stage. With the STOP=REJECT option, only the rejection boundary values are displayed. 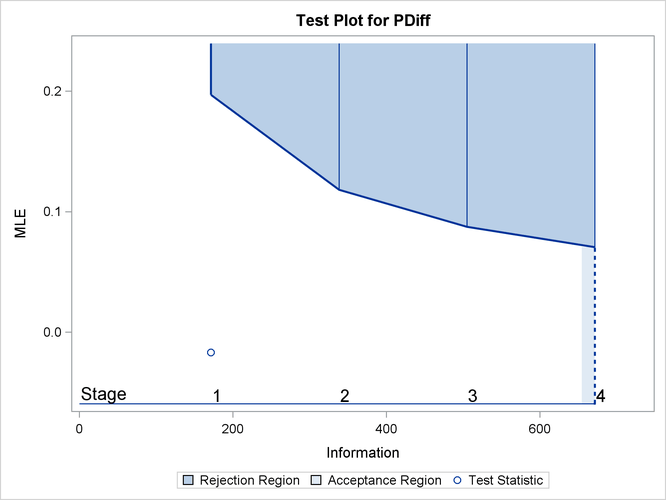 With ODS Graphics enabled, a detailed boundary plot with the rejection and acceptance regions is displayed, as shown in Output 90.4.3. With the MODEL=ONESAMPLEFREQ option in the SAMPLESIZE statement, the "Sample Size Summary" table in Output 90.4.4 displays the parameters for the sample size computation. The "Sample Sizes" table in Output 90.4.5 displays the required sample sizes for the group sequential clinical trial. When you specify CEILADJDESIGN=INCLUDE in the SAMPLESIZE statement, the "Ceiling-Adjusted Design Boundary Information" table in Output 90.4.6 displays the boundary information for the ceiling-adjusted design. Thus, 36 customers are needed at stage 1, and 35 new customers are needed at each of the remaining stages. Suppose that 36 customers are available at stage 1. Output 90.4.6 lists the 10 observations in the data set count_1. The Resp variable is an indicator variable with a value of 1 for a customer with a positive response and a value of 0 for a customer without a positive response. The BOUNDARY= option specifies the input data set that provides the boundary information for the trial at stage 1, which was generated in the SEQDESIGN procedure. The DATA=DATA_PROP1 option specifies the input data set DATA_PROP1, which contains the test statistic and its associated sample size at stage 1. The TESTVAR=PDIFF option identifies the test variable PDIFF, and the INFOVAR=NOBS option uses the variable NOBS for the number of observations to derive the information level. If the computed information level for stage 1 is not the same as the value provided in the BOUNDARY= data set, the INFOADJ=PROP option (which is the default) proportionally adjusts the information levels at future interim stages from the levels provided in the BOUNDARY= data set. The BOUNDARYKEY=BOTH option maintains both the and levels. The BOUNDARYSCALE=MLE option displays the output boundaries in terms of the MLE scale. The ODS OUTPUT statement with the TEST=TEST_PROP1 option creates an output data set named TEST_PROP1 which contains the updated boundary information for the test at stage 1. The data set also provides the boundary information that is needed for the group sequential test at the next stage. The "Design Information" table in Output 90.4.9 displays design specifications. With the specified BOUNDARYKEY=BOTH option, the information levels and boundary values at future stages are modified to maintain both the and levels. The "Test Information" table in Output 90.4.10 displays the boundary values for the test statistic with the specified MLE scale. 0.5035 338.0952 71 0.10000 0.11835 . 0.7518 504.7619 106 0.10000 0.08763 . 1.0000 671.4286 141 0.10000 0.07075 . When you specify INFOVAR=NOBS in the DATA= option in the PROC SEQTEST statement, the information level at stage 1 is computed as , where and are the information level and sample size, respectively, at stage 1 in the BOUNDARY= data set, and where is the available sample size at stage 1. Because , the information level at stage 1 is not changed. With INFOADJ=PROP (which is the default) in the PROC SEQTEST statement, the information levels at interim stages 2 and 3 are derived proportionally from the information levels in the BOUNDARY= data set. At stage 1, the statistic is less than the upper boundary value 0.19696, so the trial continues to the next stage. 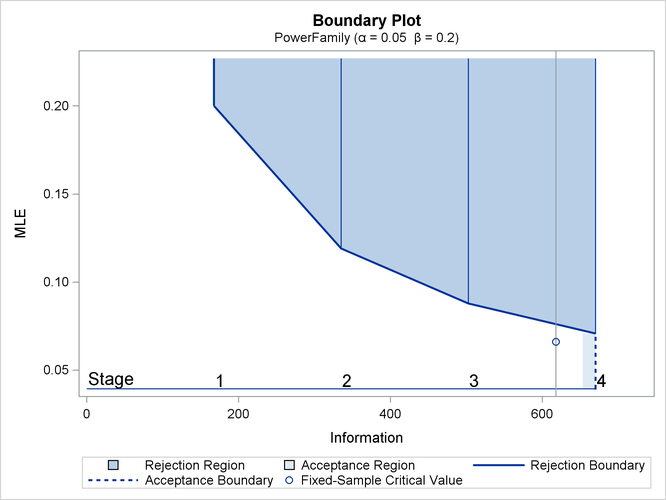 When ODS Graphics is enabled, a boundary plot with the rejection and acceptance regions is displayed, as shown in Output 90.4.11. As expected, the test statistic is in the continuation region. The BOUNDARY= option specifies the input data set that provides the boundary information for the trial at stage 2, which was generated by the SEQTEST procedure at the previous stage. The DATA= option specifies the input data set that contains the test statistic and its associated sample size at stage 2, and the TESTVAR= option identifies the test variable in the data set. The ODS OUTPUT statement with the TEST=TEST_PROP2 option creates an output data set named TEST_PROP2 which contains the updated boundary information for the test at stage 2. The data set also provides the boundary information that is needed for the group sequential test at the next stage. The CONDPOWER(CREF=1) option requests the conditional power with the observed statistic under the alternative hypothesis, in addition to the conditional power under the hypothetical reference , the MLE estimate. The PREDPOWER option requests the noninformative predictive power with the observed statistic. The "Test Information" table in Output 90.4.13 displays the boundary values for the test statistic with the specified MLE scale. The test statistic is less than the corresponding upper boundary 0.11835, so the sequential test does not stop at stage 2 to reject the null hypothesis. 1.0000 671.4285 141 0.10000 0.07075 . With ODS Graphics enabled, the "Test Plot" displays boundary values of the design and the test statistic, as shown in Output 90.4.14. It also shows that the test statistic is in the "Continuation Region" below the upper boundary value at stage 2. The "Conditional Power Information" table in Output 90.4.15 displays conditional powers given the observed statistic under hypothetical references , the maximum likelihood estimate, and . The constant c under CRef for the MLE is derived from ; that is, . The conditional power is the probability of rejecting the null hypothesis under these hypothetical references given the observed statistic . The table in Output 90.4.14 shows a weak conditional power of 0.0241 under the alternative hypothesis. 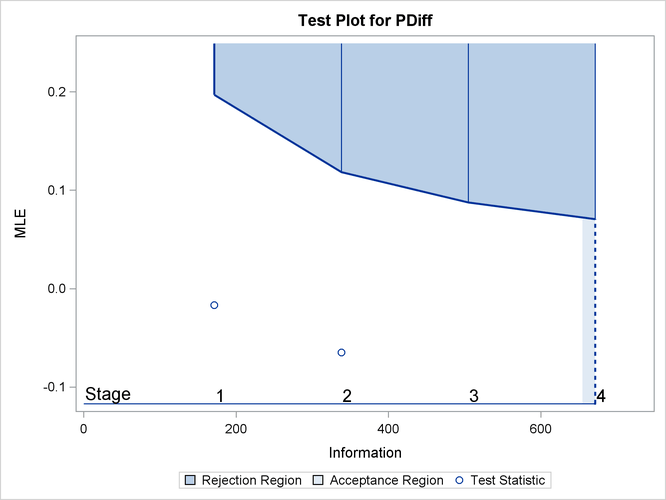 With the default TYPE=ALLSTAGES suboption in the CONDPOWER option, the conditional power at the interim stage 2 is the probability that the test statistic would exceed the rejection critical value at all future stages given the observed statistic . The "Conditional Power Plot" displays conditional powers given the observed statistic under various hypothetical references, as shown in Output 90.4.16. These references include , the maximum likelihood estimate, and , where is the alternative reference and are constants that are specified in the CREF= option. Output 90.4.16 shows that the conditional power increases as increases. The predictive power is the probability to reject the null hypothesis under the posterior distribution with a noninformative prior given the observed statistic . The "Predictive Power Information" table in Output 90.4.17 indicates that the predictive power at is 0.0002. With a predictive power 0.0002 and a conditional power of 0.0241 under , the supermarket decides to stop the trial and accept the null hypothesis. That is, the positive response for the new store-brand coffee is not better than that for the current store-brand coffee. The following statements invoke the SEQTEST procedure to test for early stopping at stage 2. The NSTAGES=3 option sets the next stage as the final stage (stage 3), and the BOUNDARYKEY=BOTH option derives the information level at stage 3 that maintain both Type I and Type II error probability levels. 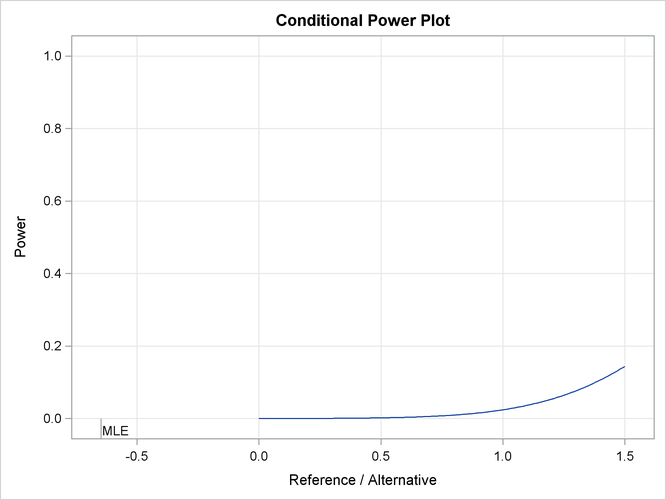 The CONDPOWER(CREF=1) option requests the conditional power with the observed statistic under the alternative hypothesis, in addition to the conditional power under the hypothetical reference , the MLE estimate. The "Test Information" table in Output 90.4.18 displays the boundary values for the test statistic with the specified MLE scale, assuming that the next stage is the final stage. 1.0000 648.8122 136.2506 0.10000 0.06825 . The "Conditional Power Information" table in Output 90.4.19 displays conditional powers given the observed statistic, assuming that the next stage is the final stage. The conditional power is the probability of rejecting the null hypothesis under these hypothetical references given the observed statistic . The table in Output 90.4.19 also shows a weak conditional power of 0.02318 under the alternative hypothesis.